Once you are in the pristine environment of Wanaka, the desire to live sustainably, buy organic, be green comes to front of mind. 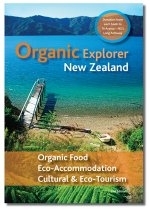 I found a book recently at Soulfood Organics called “Organic Explorer – Green Travel Guide to New Zealand“. Gives some great suggestions for those who are travelling around some nice ideas for “green” places to stay, eat and things to do. They are about to publish an updated 2nd edition. Here is a link to the online database for Otago which gives you a flavour of what the book is like.